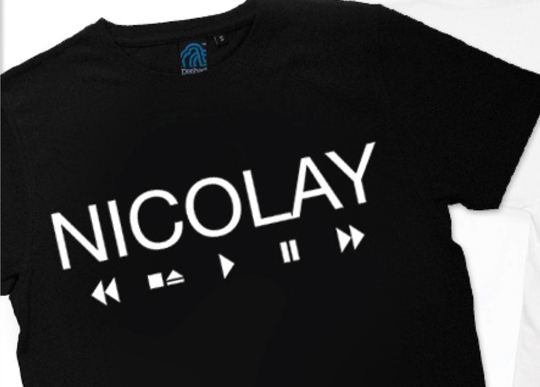 In the world of music, often producers and songwriters get overlooked in the shadows of the performers they support, but that's hardly the case with Nicolay. The crowd at Lola made sure he knew how much St. Louis loves his work and his passion. Every table in the downtown club was reserved well in advance, and the bar was full long before the music started as the staff tried to accommodate the quickly growing crowd, buzzing with stories and expectations for the night's show. Nicolay, born Matthijs Rook, started his life and much of his musical career in the Netherlands, playing with a variety of relatively-unknown bands starting in his youth. As his delight for music blossomed, he developed as a multi-instrumentalist and started composing and producing his own work. In a testament to the global community created by the Internet, an online forum brought him together with Phonte Cole, a talented emcee with the hip-hop act, Little Brother (with 9th Wonder and Big Pooh), and the Foreign Exchange was born. The crowd at The Blue Room on Thursday night was not easily impressed, a right they duly reserve. During Kansas City's jazz heyday in the 1930's and 1940's, upwards of 140 or so jazz clubs sprawled across the KC metro, with the real epicenter scalding at the 18th & Vine neighborhood which included approximately 40 jazz clubs on a single strip. The Blue Room is just one of them. Based off speaking to one of the American Jazz Museum's more integral figures on Thursday night, he painted a picture for me that I could only describe as a Westport on steroids while we did our best to compare the current Westport dance crowds with the jazz scene in the 30's and 40's. Though that era has passed, Kansas City's old jazz explosion has shrapnel still flying today in 2012. Dutch producer, Nicolay, probably most loved for his work as part of The Foreign Exchange alongside North Carolina rapper, Phonte, has built a reputation as a real favorite for the hip hop and jazz aficionados kicking it amongst us. As usual when I attend a show there, the host at Thursday's show asked the audience how many of them had never been to the Blue Room before. I could guess that it's at shows like this in which a scheduled performer mixes hip hop into their jazz set or is known for hip hop work, where the Blue Room tends to see a lot of unfamiliar faces under their roof at the corner of 18th & Vine. I can specifically remember Reach, Izmore and Diverse's live hip hop tribute shows at The Blue Room wherein what seemed like nearly half of the crowd raised their hands to note their first time to the venue. Nicolay's clout for warm, relaxed beats injected the Blue Room in the historic 18th & Vine Jazz District in Kansas City, MO on Thursday with a shot of new faces. And unfortunately, a lot of Kansas City music heads probably missed out on this event. I went to the show after hearing about it for the first time on the day of. It's very rare that I go to a concert and leave speechless. The recent Nicolay (one half of Foreign Exchange) and The Hot At Nights session left a very lasting impression. I can hardly describe just how good the music they performed felt. I was nodding my head, dancing in my seat and smiling hard throughout their performance. This night was all about the music, the good vibes; a night purely for music lovers. Now there was no elaborate set, pyrotechnics or even any singers, there were four extremely talented musicians. That's correct it was a performance of instrumentals! Nicolay (synth/keyboards), Matt Douglas (saxophone/woodwinds), Chris Boerner (8-string guitar) and Nick Baglio (drums), walked on stage, as if they were invited up at an open mic. They sat down at their particular instrument, Nicolay did a brief intro and they dived straight into the music. I should have asked for a set list, but the second track they performed was BANANAS! I honestly think I got whiplash from nodding my head so profusely! The instrumentation on that track was incredible and flawless. It was definitely that feel good music, the type that makes you close your eyes and meditate on the vibes. I was once again in a zone, enjoying every musical note and eager for more. The next track was off of the collaborative album between Nicolay and Raleigh, North Carolina-based jazz trio The Hot At Nights, The Shibuya Session EP, "The Inner Garden", which just further engaged the audience. At this time, Nicolay decided to treat us to a revised version of Foreign Exchange's "Happiness" off their 2004 album Connected. What a beautiful revision to an already classic track, most enjoyable. The track "Bullet Train" was quick, literally the speed of a bullet, nonetheless one of the most appealing tracks they performed.